Very nice place, very well located, they have a restaurant where the breakfast is served in the morning, and they give you disccount cards to eat there, the food is very tasty. In general the place is clean and comfortable, the only point they can be better is in the distribution of the space of the rooms, in the one I stayed we had only 30cms to move accross the room and no much place for our backpacks, but there was enough space if the beds were placed in a different way. Sklep Hostel is honestly the best hostel I've ever stayed in. It's extremely easy to find, it's got a nice, quiet atmosphere, and the staff are really friendly and helpful. Our apartment-style room was very clean, and it included a small kitchen area, a balcony, a washing machine and drying rack, and a tv! I've paid a lot more at other places and gotten a lot less, that's for sure! Breakfast is included! Would definitely stay again! 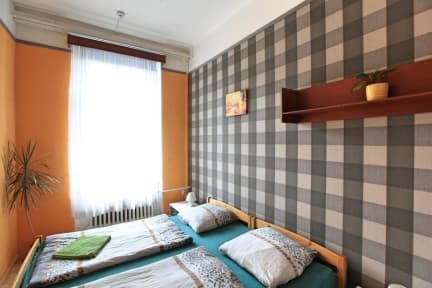 For anyone looking for a cheaper night's stay in Zizkov (it's just 10 mins from the centre) this is the place! So many facilities in our room (fridge, cooker, microwave ... even a washing machine!). The staff are friendly and the breakfast in the morning is tasty and never the same. Would definately go back! Fantastic place to stay. 2 streets from main railway approx 10 mins walk or 2 stops on tram to right outside the door. 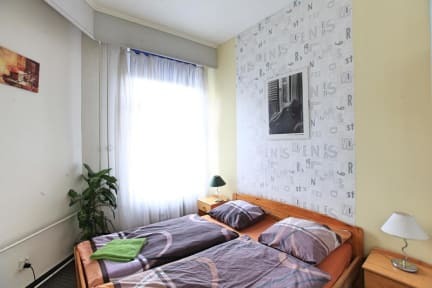 The APARTMENT we had was newly created and had a double and a single bed,dining table and chairs, fully equipped kitchen and a lovely ensuite with a really powerful shower loads of hot water. The breakfast was included. The attached Restaurant served amazing food with generous portions. Definitely try it. Sklep Hostel is located above the Sklep Restaurant in a quiet corner of town. The restaurant is fantastic, and breakfast is incredible. There is a downstairs bar where you can meet people. Staff was very friendly, as is everyone in the city. The main disadvantage is the location. It's relatively far away from the center, but there is a tram stop just outside the hostel. Overall, it's a great place. Very tidy and welcoming. Was surprised to find out we had essentially booked an entire apartment suite. Great value for money, but very far from Old Town. Everything you need for a decent price. The restaurant below is a cozy and quaint little one with great food and breakfast is included. Rooms are still quiet even though it is above a restaurant and facilities are decent and sufficient.